In the event of a disaster, you may be instructed to shut off utility services to your home. If this were to happen, would you know what to do? Here are some general guidelines. Natural gas leaks can cause fires and explosions during and even after a disaster. If it is possible all adults in your home should know the process for shutting off the natural gas supply to your home. We recommend that you first consult your local gas provider to be sure the process can be done safely and effectively. There are different shut-off procedures for different types of gas meters, so contact your local gas company for specific instructions. 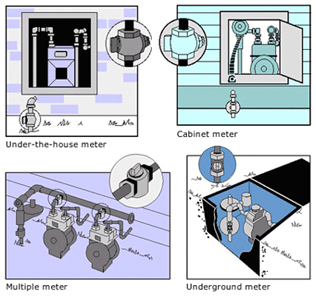 Once you learn the proper shut-off procedure for your meter, you should decide who of your family members should know this information. Also when conducting an emergency drill with your family, be sure not to actually turn off the gas. If you smell gas or hear a blowing or hissing noise, open a window and get everyone out quickly. Most gas appliances have shut-off valves. If there is a leak, turning off the valve to a specific appliance may suffice. 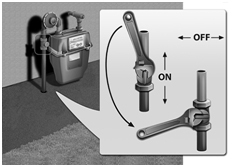 If you are unsure of the leaks origin, turn off the gas using the outside main valve and call the gas company from a neighbor’s home. If you turn off the gas for any reason, a qualified professional must turn it back on. NEVER attempt to turn the gas back on yourself. Disasters can also pose a danger to your clean water supply. During and after a disaster, cracked lines may pollute the water supply to your house. Depending on the emergency it may be wise to shut off your water until you hear from authorities that it is safe for drinking. You may also need to preserve water by filling up your bathtub or other temporary containers. Before a disaster strikes, know where the main water valve is for your home and learn how to turn it off. Make sure the valve is free from rust and can be shut off completely. 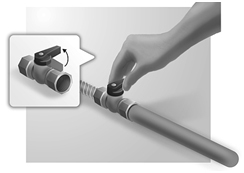 Label the valve with a tag for easy identification, and make sure everyone in your family knows where it is located. 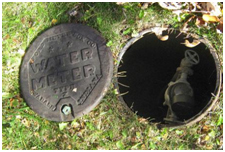 Most main water shut-off valves can be found outside under a small manhole cover or in your basement or crawl space where the main water line enters your home. Electrical sparks and power surges during and after a disaster have the potential to ignite natural gas fumes, damage electrical equipment, and even have the potential of electrocution. As a precaution, teach all responsible household members where your circuit box is and how to shut off the electricity. For your safety, always shut off all of the individual circuits before shutting off the main circuit breaker. Lastly, utility lines provide the vital lifelines to your home and to your neighborhood. Before you do any construction or digging on your property, call 811 to locate underground utility lines. You can also call the Utility Notification Center of Colorado (UNCC) at 1.800.922.1987.